I can assure you that it is NOT remastered, whatever the packaging states. I just brought a copy of this on eBay, and compared Wav files with the original 1987 release. Exactly the same. no sound improvement, same eq, same volume, etc. I was curious about this so had to try and get hold of a copy to do my own tests. Can't believe this album hasn't had some sort of deluxe edition treatment. It's a classic! I can only think of it being record label garbage that's getting in the way. Only BIEM on labels, and "Debut Album"- sticker on front. Not on discogs. if this is printed and made in Holland, surely it is a Dutch copy? A great album for the tone deaf. I'm not sure what the big deal about "Sign Your Name" is; a song featuring a drum machine and a few triads being played on a keyboard. Can anyone conform this is really remastered. I have my doubts. A triumph of soul/R&B in its time & most of the album hasn't dated. Seven More Days is a timeless classic, as is Who's Loving You. It may currently be a 'guilty secret', but there is no need for that. This album is a classic. That is all. 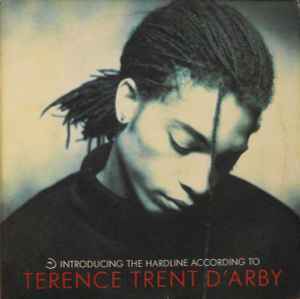 Armed with finest of studio production and delivery even by today's standards, 'The Hardline' is a stunning listen, a deserved classic and a masterpiece right from the heart of then-youngster D'Arby. Truly amazing a debut laying foundations in one's impressive career. I know this artist mainly because of his few hit songs here in North America. So, I picked up the LP to give a listen to the whole album just to see is his most famous song, Wishing Well, is also his best. I was surprised to find that this album is solid all the way through. There is a good flow song-to-song and definitely something I can listen to again and again, even if I do play Wishing Well more than any other song. To be honest, I never really could understand what most the the lyrics were to Wishing Well, but after all these years, seeing the lyrics -- I like the song even more. The album starts out a bit subdued, with a definite 80s sound/feel to it, but it soon picks up and I forget all about the 80s and just get into the music.